Roof Truss Failure, making sure your new home is built correctly- Armchair Builder :: Blog :: Build, renovate, & repair your own home. Save money as an owner builder. Any new home can have a roof truss failure if the installers don’t follow directions. Trusses have many advantages over standard beam framed roofs, including faster install times, lower costs, and ease of installation. But in order to get a quality end product for your roof framing, the carpenters need to follow all of the manufacturer’s directions. Here are some things to check to ensure you don’t have a roof truss failure on your new home. In any given home, there could be five to ten, or even more, different types of trusses in the design so it’s important to make certain they are installed in the correct place. Most roof truss packages come with a detailed layout from the manufacturer showing which trusses go where. By just misplacing one component, there could be a roof truss failure. How do you check? Most truss manufacturers put a number on each type of truss that corresponds with the layout. All roof trusses come with a requirement to brace them into place. Basically, this involves installing a certain size of lumber, either 1x or 2x, across a specific location on the trusses to tie them together. This way, the trusses work like a system…when a load is placed on single truss, the others “chip in” and help out as the bracing helps transfer the load to the adjacent trusses. The manufacturer’s truss diagrams will show exactly what kind of bracing is needed and exactly where it needs to be installed. The carpenters framing the home should never deviate from these requirements or a roof truss failure could result. Want to see an example of a roof truss failure in real life? Check out this article from the International Code Council. When installing a roof truss system, it’s important to follow the manufacturer directions for nailing. This would include the type and size of nails, spacing, and locations. As a builder I can tell you there are two basic spots where I see carpenters with inferior nailing. First, any metal hangers or straps always require a specific nail. Carpenters are notorious for using whatever fastener they have in their pouch instead of reading the directions and going to the trailer to get the correct nails. If these nails pull out, the hanger or strap will be useless and can create a roof truss failure. The other location to check carefully for proper nailing is on a multi-ply girder truss. Basically these involve nailing together several single trusses so that other members can be carried by the girder. The manufacturer will call out exactly what type of fasteners are to be used, where the they go, and how much space should be between them. 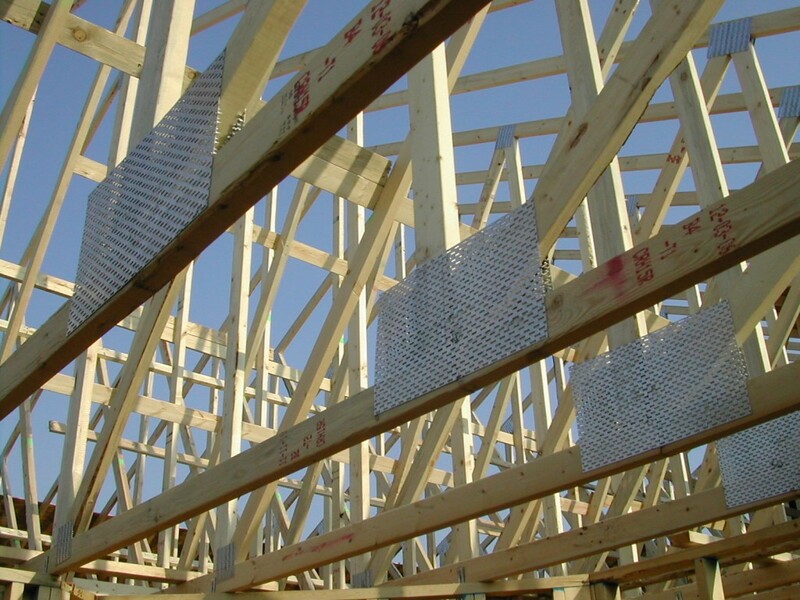 Improper nails or fasteners could result in a catastrophic roof truss failure in a new home. Roof truss’s are a great way to build a new home’s roof structure. Just be sure you, or your builder consultant, carefully checks the installation with the manufacturer’s layouts and directions.